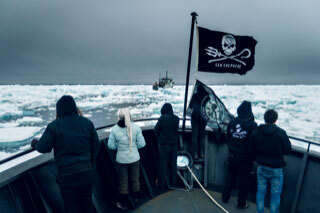 The eco warriors of Sea Shepard embark on a high seas, 110 day, 10,000 mile chase to catch the illegal fishing vessel Thunder, the notorious poaching boat. The chase takes the audience on an exhilarating ride to the farthest reaches of the planet on the world’s longest maritime pursuit. Friday Harbor Film Festival is proud to have honored Captain Paul Watson with its Lifetime Achievement Award as founder of Sea Shepherd and a lifetime of marine wildlife conservation and activisism. Come and see this inspiring and exciting sea adventure April 2 at the Grange, 7pm.